The Mamba is simply awesome. Period. It is not, however, a good EDC. At least in my book it isn’t. I think this feeling applies to many Mamba owners. I think we’ll see plenty of Mamba fan-pictures online, but I doubt I’ll ever see (m)any pics of that sweet curvy black blade all scratched up from use. 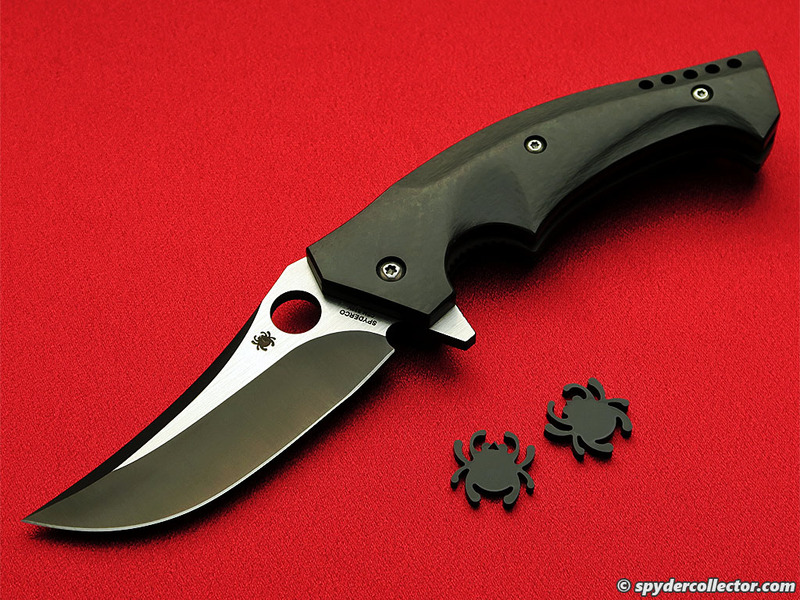 As is the case with many new Spyderco knives, the Mamba was love at first sight for me. I knew right away this knife would be too big for comfortable everyday carry. And that blade would not excel in any of my daily cutting tasks. 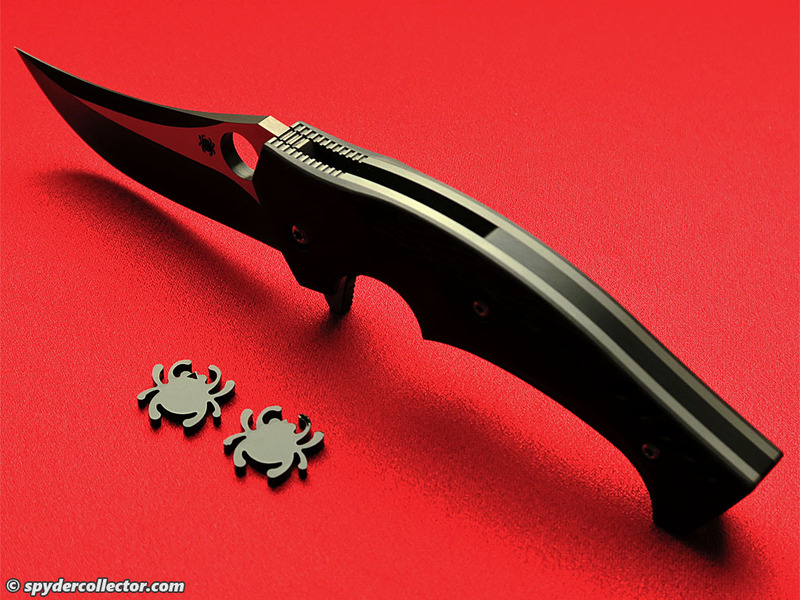 And yet, it’s a great design; a beautiful knife that just screams ‘hell yeah!’ And in my book, sometimes, that’s fine. Not every knife in my collection has to be a purely functional folder. 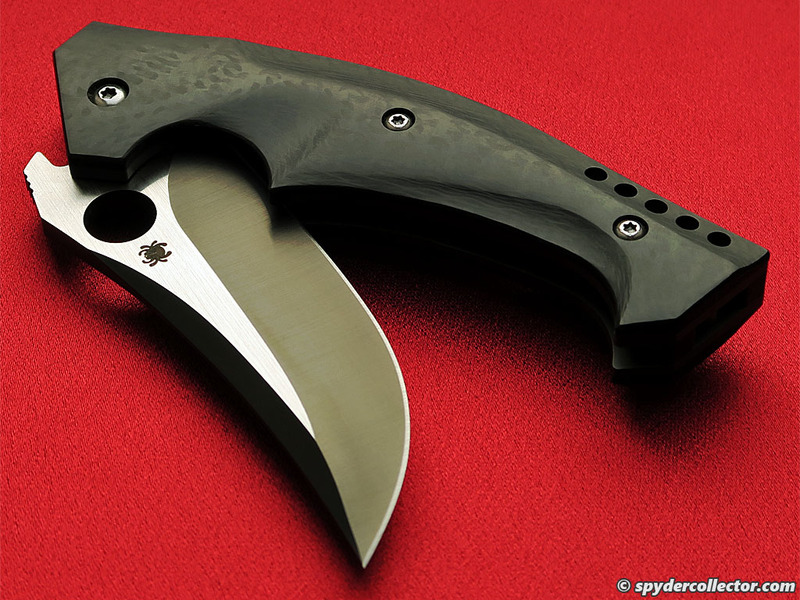 The Mamba’s blade is all sweeps and curves, and the flipper adds a lot of ‘panache’ as well as a functional guard. The coating is applied very evenly and it’s a kind of see-through burnished black color. I think this makes for an interesting visual effect when you study the coating from different angles. The major downside of the blade is well-known and plenty discussed in YouTube comments and forum threads, that awful dull heel. 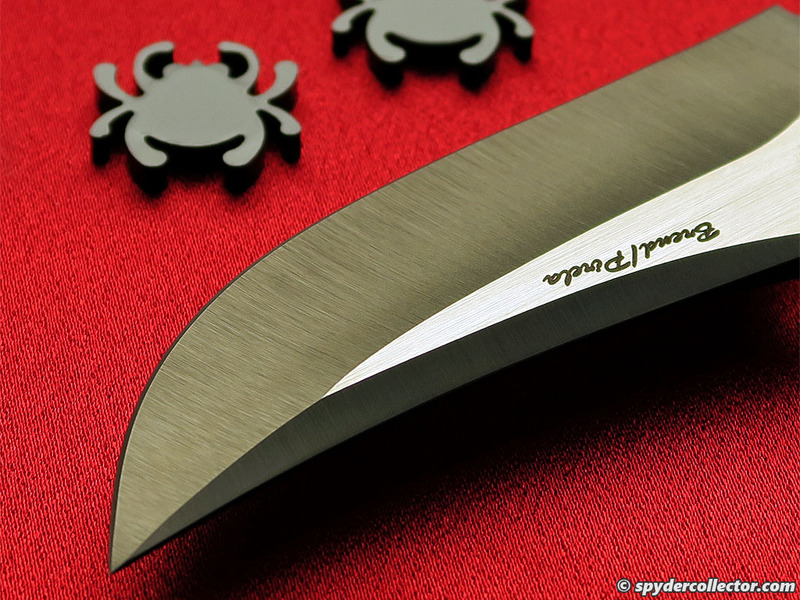 Because of the deep plunge grinds, the hollow grinds don’t come immediately together for an edge at the heel of the blade. This results in about a centimeter of non-sharpened blade. And that’s a shame from a user’s point-of-view. It doesn’t really matter to me, as I appreciate those sweet grind lines a lot more than the edge. Don’t get me wrong though, this knife came very sharp from the box. I cut myself a handful of times when my fingers didn’t move out of the way fast enough, when I closed the blade. The action is extremely smooth. The liners are so thick, I feel it’s really more of Reeve-style integral lock than a linerlock. 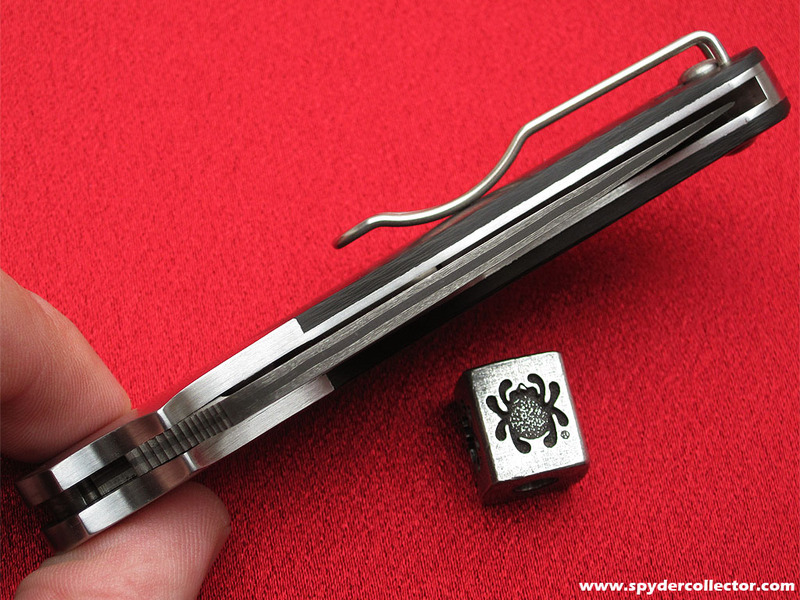 The lock’s ball detent is very positive, but once you move past it, the blade absolutely flies open. The Mamba is perhaps the fastest opening knife in my collection. The lock is massive and the lock-up is solid. I can’t detect play in any direction when the knife is locked. 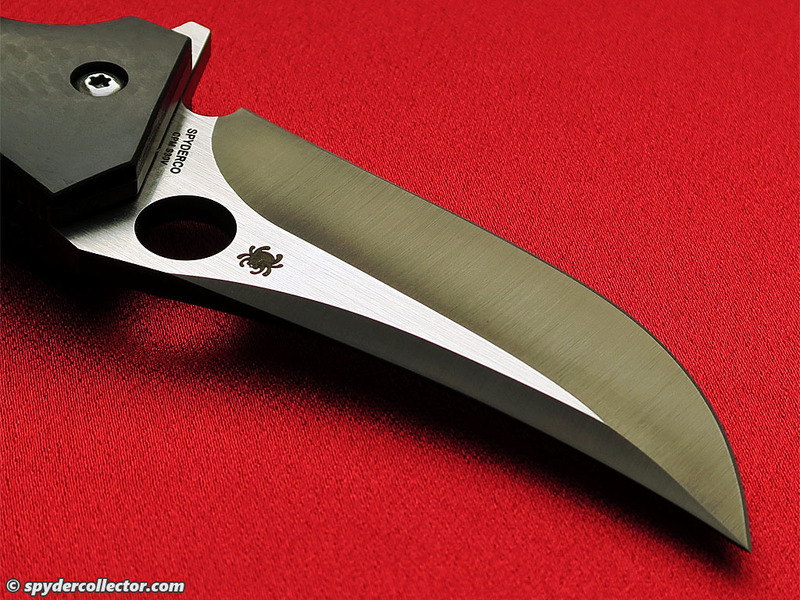 The detent is perhaps a bit too strong, but considering the size and mass of the blade, that’s probably a good thing. 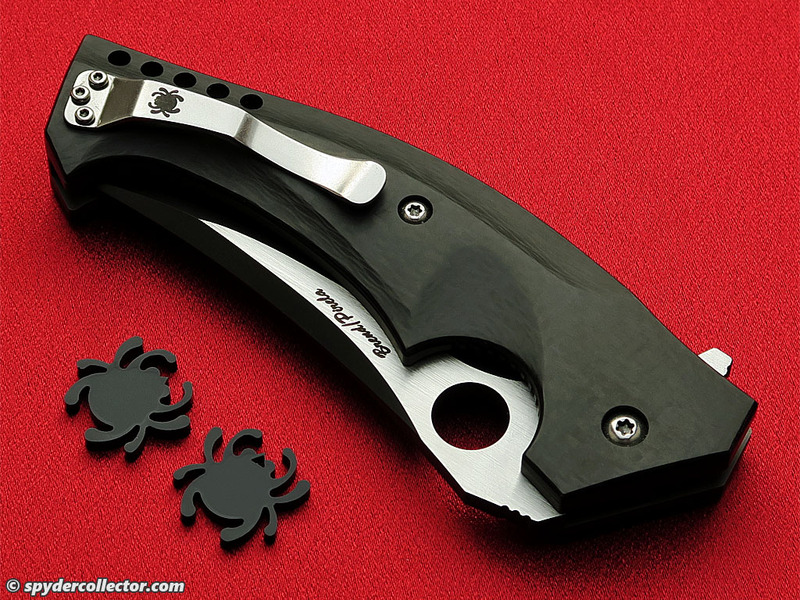 The Mamba’s handle was mainly designed by Joel Pirela and it looks stellar. It feels even better. 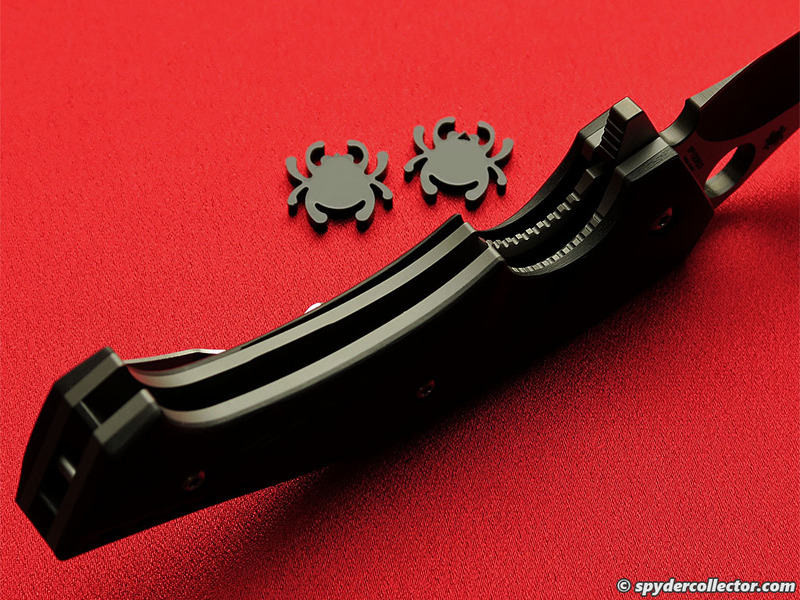 The handle is very comfortable and ergonomic……for edge-out grips. Your hand locks into the handle like a glove, but it’s not a versatile handle that you could easily use for peeling apples, potatoes etc.… For actual utility work that requires an edge-in grip, I think you’d better reach for a different knife. The Mamba is hard to control for these types of detailed cutting chores. 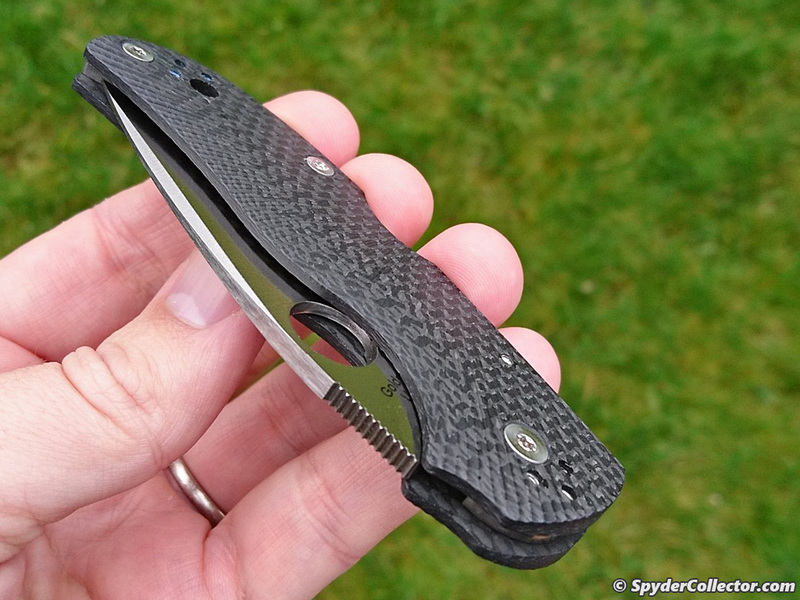 The carbon fiber looks superb, and I love the details and facets in the handle. The Mamba features stellar fit & finish work. On the downside, the handle is -to me- simply too big, thick and angular to comfortably carry in my pocket or waistband. 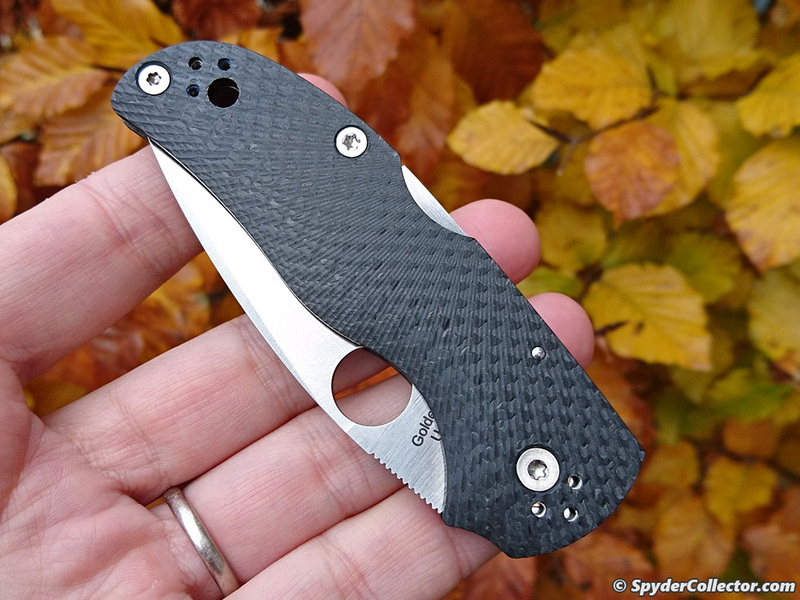 This is one of those knives in my collection that just won’t be seeing any serious pocket time. 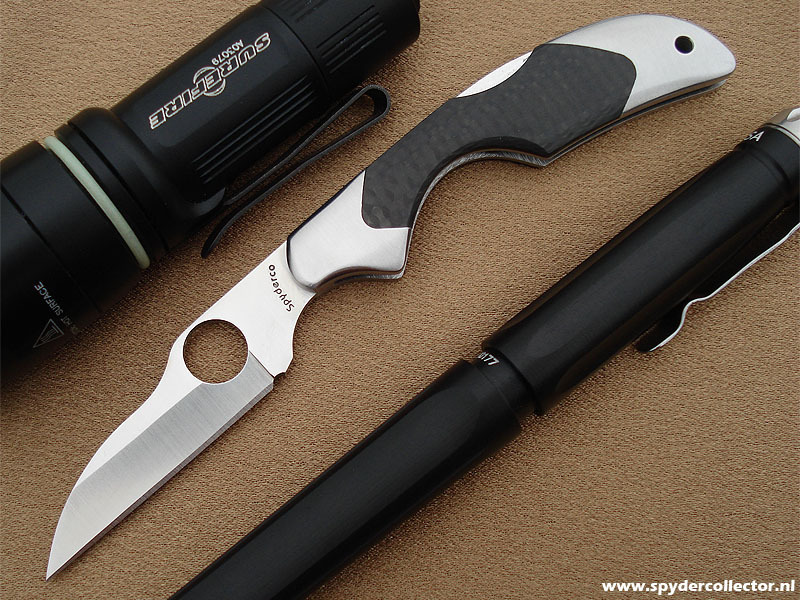 The Mamba features a custom clip that is more ‘Spyderco’ than the rest of the design. 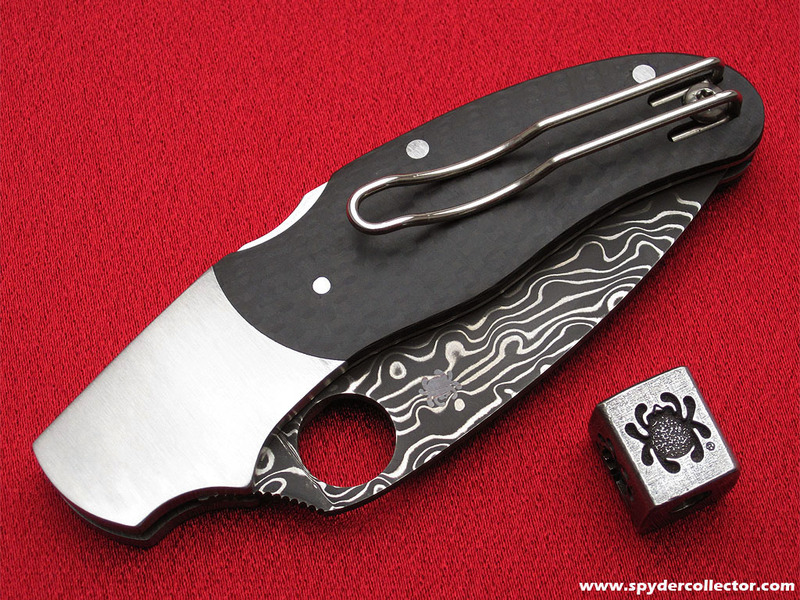 It mimics the familiar hourglass shape clip we see on almost all spydies these days, but the three-screw attachment is different from what we’ve seen so far from Golden, Colorado. The clip works well though, the tension is fine. I appreciate the black bug on the shiny spring steel, it fits the design very well. 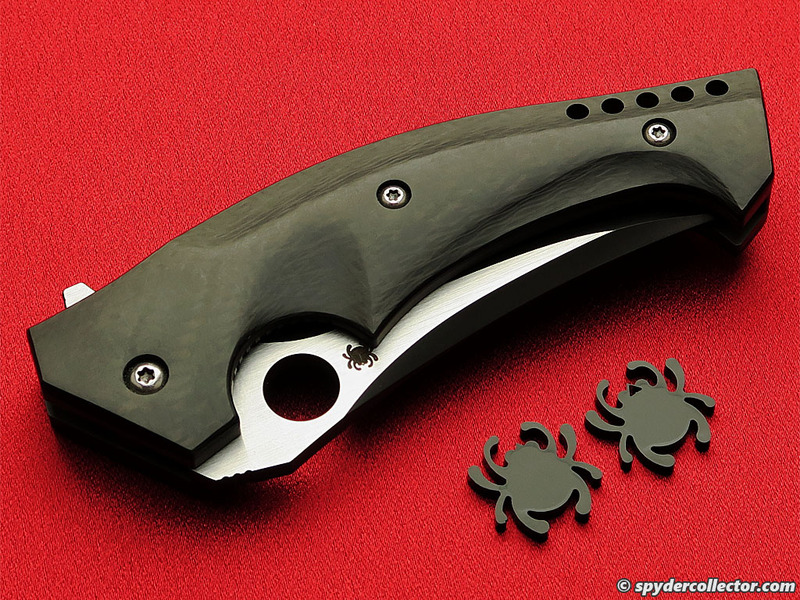 When it comes down to it, I strongly feel that getting a Mamba is not a pragmatic and practical decision-making process to fulfill a particular cutting need. 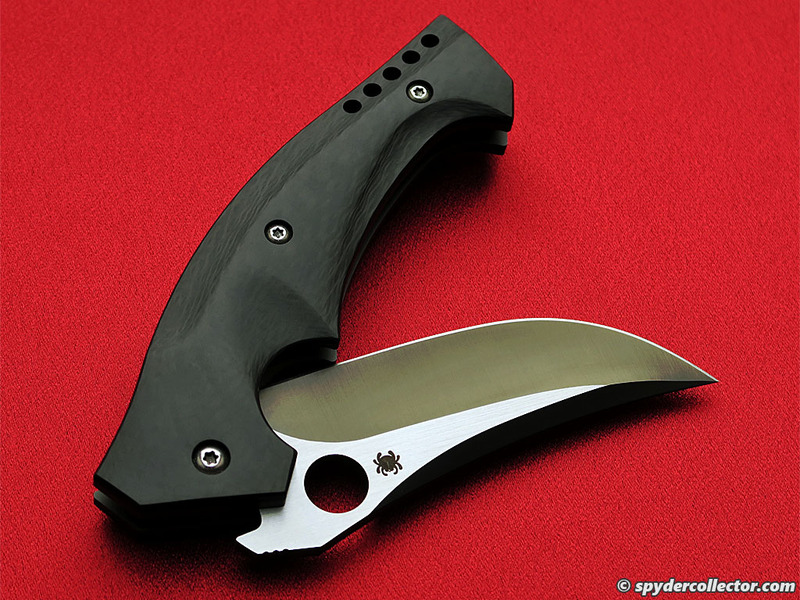 If you’re even a casual knifeknut, you’ll likely to be drawn to those spectacular features of this audacious design. And there’s nothing wrong with that. I’ve enjoyed many an evening enjoying a movie, nursing a Talisker in my left hand and the Brend/Pirela Mamba in my right hand. As the famous YouTuber would say: ‘life is good’. As a long time fan of the Caly/Calypso Jr./UKPK design, I simply ‘had’ to get this Caly 3 sprint run. I am definitely not disappointed. 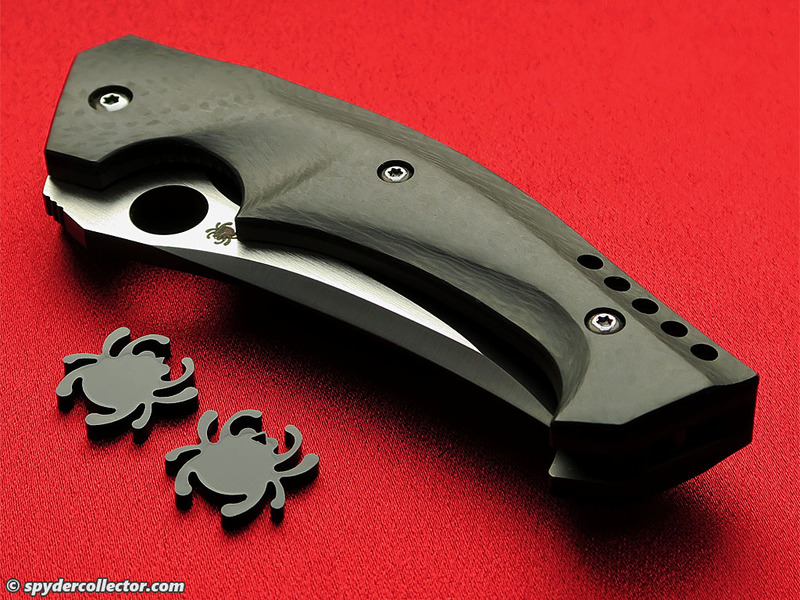 Contrary to the earlier Damascus Delica sprints, this one could be an actual user. 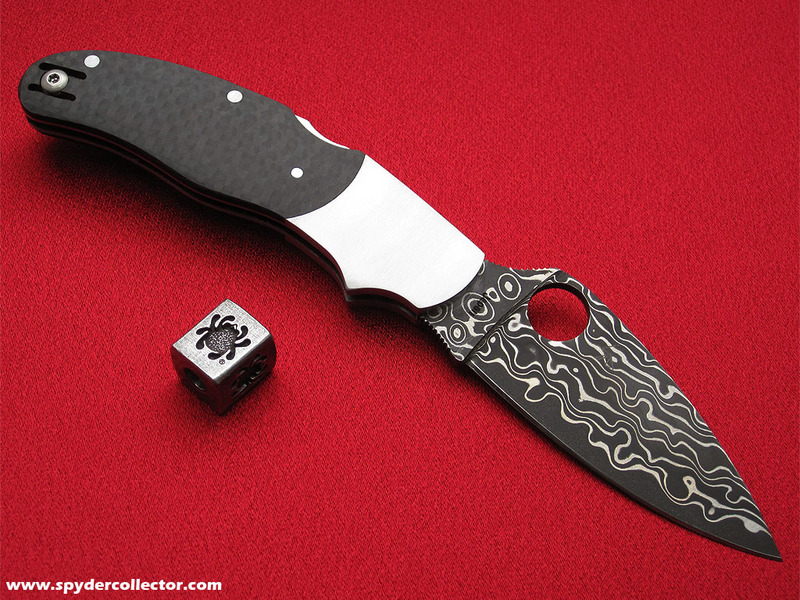 The Damascus blade looks excellent, I love the dark wavy lines. 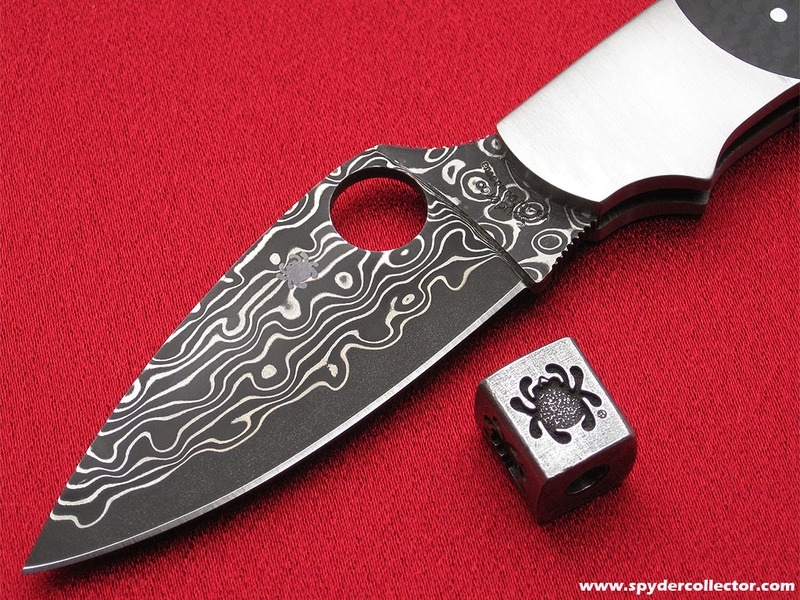 It also doesn’t hurt that this is a stainless VG-10 damascus, so it´s good to go for EDC in my book. 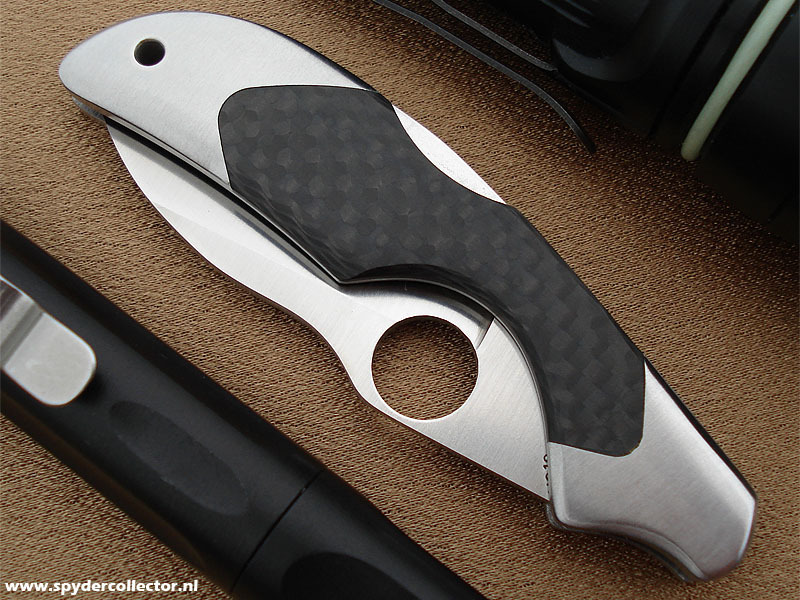 The fit and finish are excellent: the action is smooth, good self-close on the blade, excellent tight lock-up and the bolster is seamlessly mated to the carbon fiber handle. The blade is centered too on my sample, if that’s something you care about. I had one little problem with the knife. It was tough to change the clip for the ‘right’ left-handed carry position. It was tough to get the screw assembly out of the handle. The tolerances are so close, that I had trouble pushing out the bolt-part of the clip assembly. Once it was out and fitted for left-handed carry, I noticed the clip didn’t entirely want to touch the handle. It took me a bit of bending and fitting, before I managed to fit the clip for my preferred carry position for the Caly 3. Ideally, you’d want a clip change to be a ‘drop-in’ affair and not a session of bending and fitting. 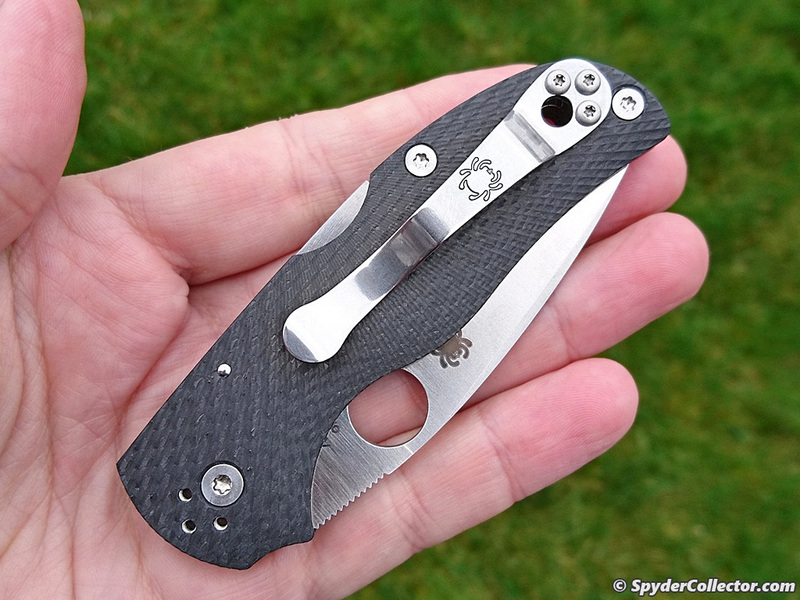 Still, I got the coolest left-handed Damascus/CF spydie on the block now ;). Overall, this edition of the Caly 3 is a nice tribute to the designer, Sal Glesser, and the wonderful craftsmen in Japan who made this knife. 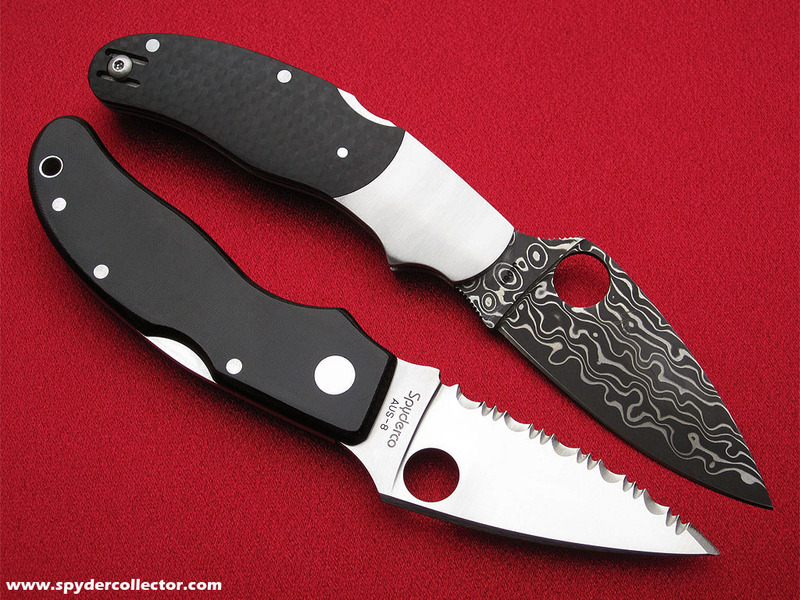 It’s been great to see this knife evolve from the original Calypso Jr. with stainless steel or micarta handle. 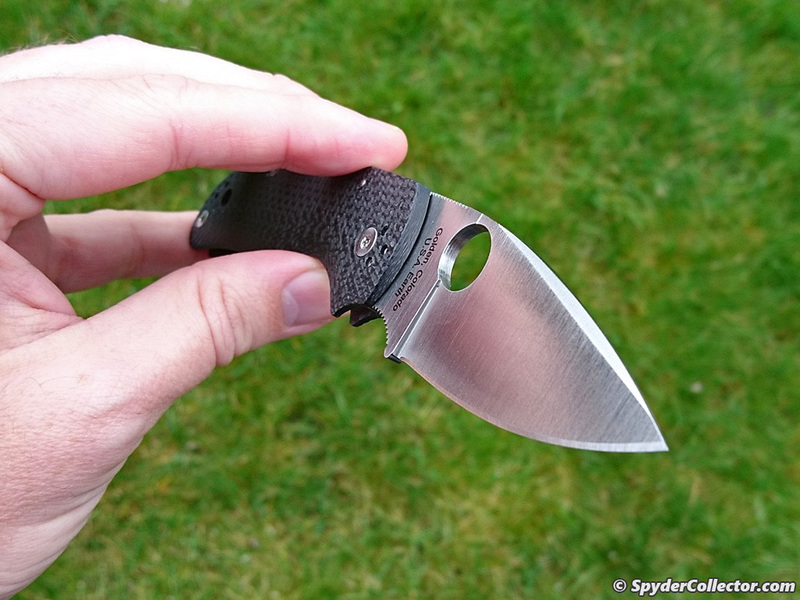 The stainless steel Calypso Jr. was a great start, although it never saw much pocket time. I always felt this folder was too heavy for its size. 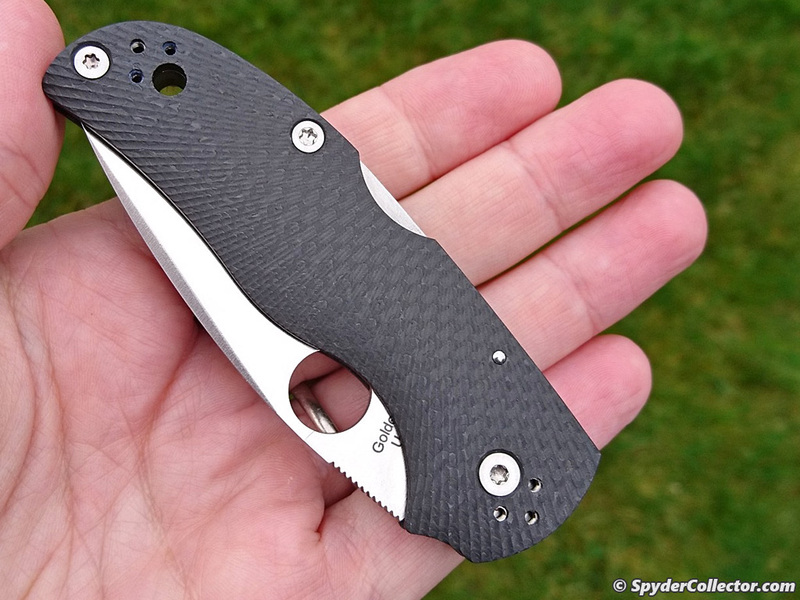 The micarta Calypso Jr. is a great lightweight folder. Still, too bad about the right-hand-only-tip-down clip and the fact that I only managed to score one with a serrated edge. 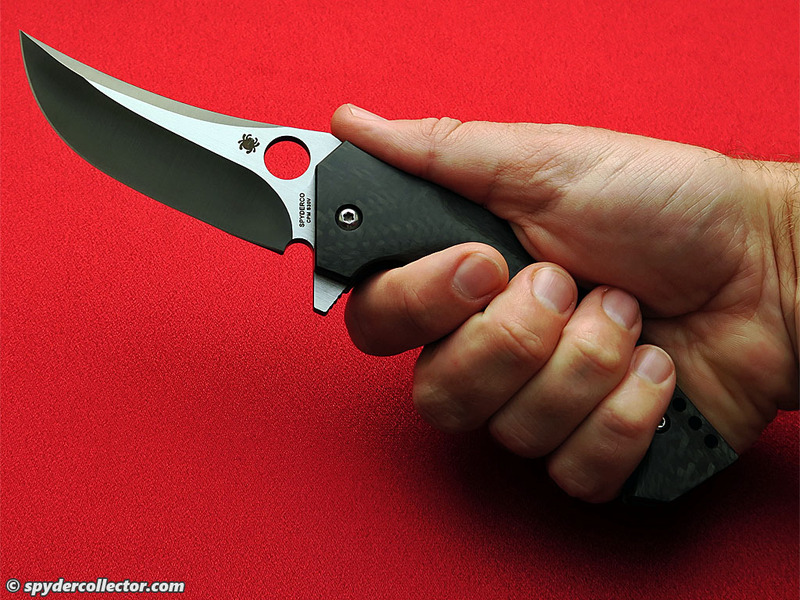 The FRN Calypso Jr. was a wonderful revelation for this lefty, well over ten years ago. 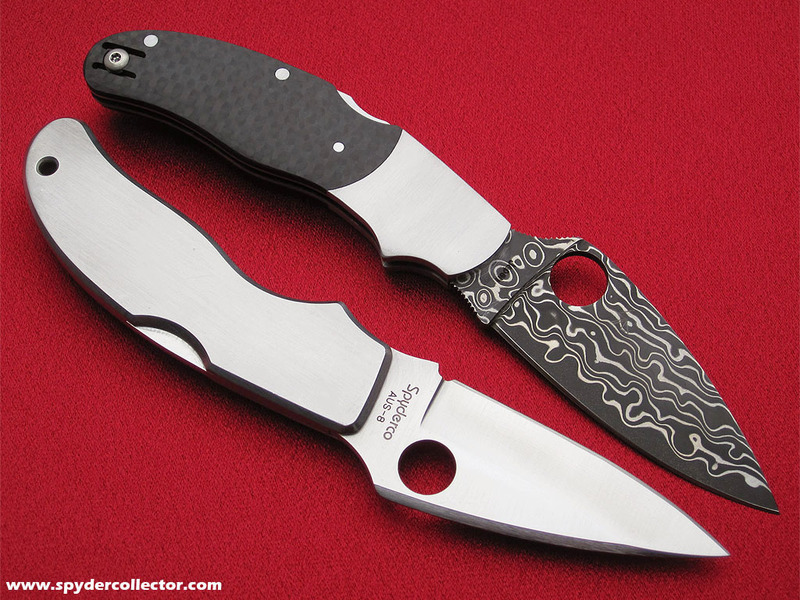 The Caly 3 and UKPK models are wonderful evolutions of the Calypso Jr.; getting rid of that sharp cusp on the blade’s spine and adding better blade steels and handle materials. 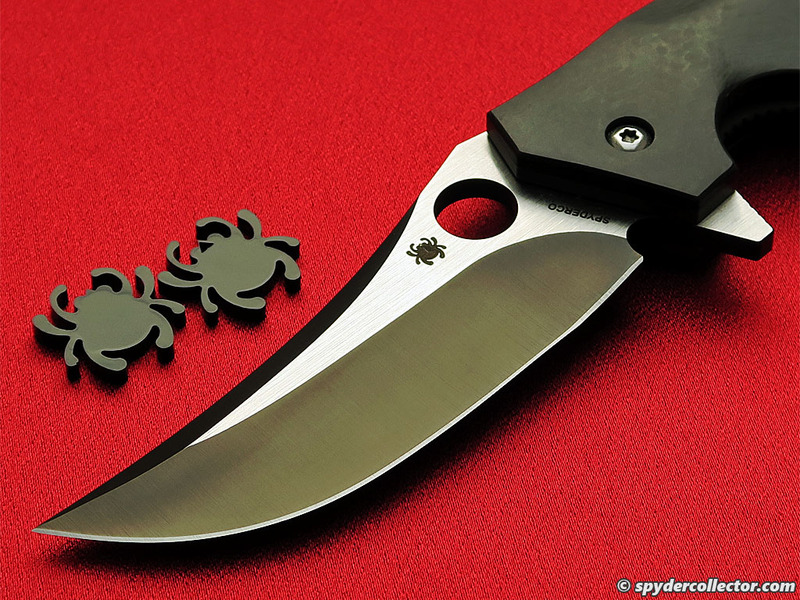 Together with the Delica, the Caly 3/UKPK model is my favorite 3-inch Spyderco utility folder. 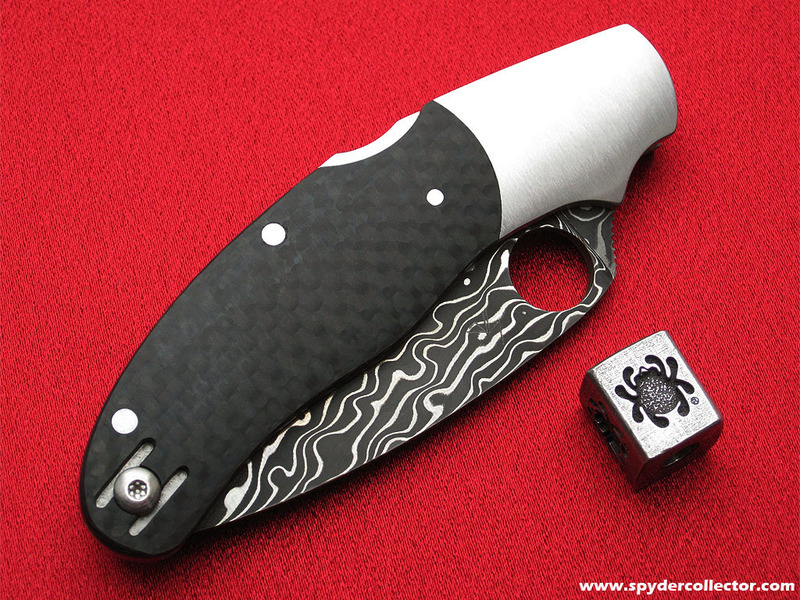 This damascus & carbon fiber sprint run is an awesome edition for us afi’s. It’s a great pocket knife with plenty of bragging rights. I’m sure this one won’t get any cheaper in the next few years. 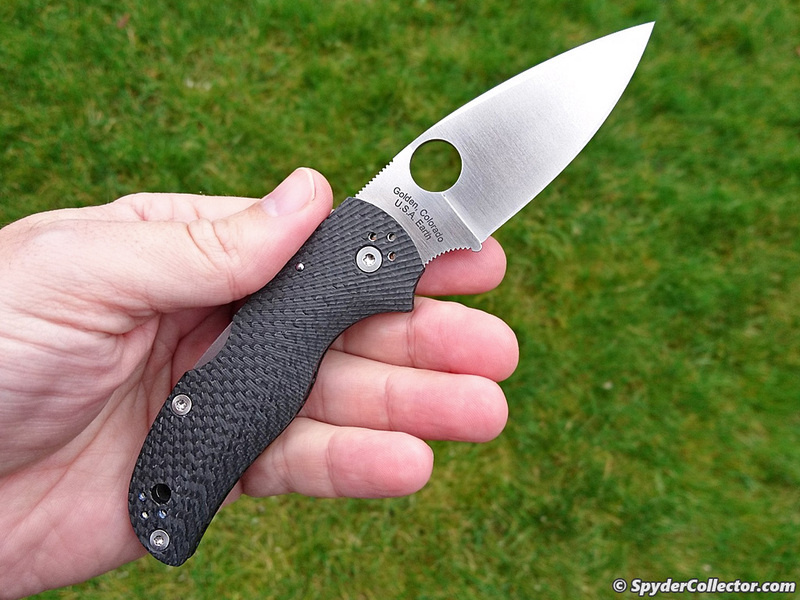 There’s only one prototype in this video and it doesn’t get much screentime, but my buddy Jurphaas gives a great presentation of all the recent and current Spyderco models with carbon fiber handles. This one has been sitting in my pocket for quite some time. I finally took it out for a ‘walk’ with my digicam. Now if only we could get a CF Kopa next year ;-).